High-skilled immigration has transformed US innovation over the past five decades. Back in 1960, immigrants represented about 6.6% of those employed in occupations associated with science, technology, engineering, and mathematics (STEM). Today, the immigrant share for STEM occupations stands at 29% using the American Community Survey (Hanson and Liu 2018). Bernstein et al. (2018) further calculate that a bit over 30% of US innovation since 1976 can be credited to direct and indirect contribution of immigrants. National diversity among skilled immigrants is also connected by Docquier et al. (2018) to substantial economic growth for US regions. These figures tell a remarkable story, and the US has held a very special place in terms of absorbing global talent. In a new book, I start by assembling data from sources like Hanson and Liu (2018), Miguelez and Fink (2013), and Kerr et al. (2016, 2017). While we don’t know every data point that we would like to, there are clear regularities like rates of international migration rising by skill level, a huge share of skilled immigration going to the US, and a disproportionate immigration impact on the US at higher skill levels. Within the US patent data, one can best observe the ethnicity of inventors through their first and last names. The intuition is that inventors with the surnames Chatterji or Patel are more likely to be of Indian ethnicity, whereas Wang and Ming are typical names of people of Chinese ethnicity. Trends in ethnic patenting line up very closely with immigration data. In 1975, more than 91% of US-based patents were invented by people with Anglo-Saxon or European ethnic names. By 2015, these traditional groups accounted for 72% of patents, with most of the share change coming in the exceptional growth of Indian and Chinese ethnic innovation that today represent about 18% of US patents. Other ethnic groups like Hispanic and Korean inventors have also become more important. Figure 1 shows just how broad-based this ethnic patenting growth has been over the six major technology fields frequently used to group patents (the shares sum the non-Anglo-Saxon and European contributions). Immigrants have their greatest impact in more advanced technologies, but every line is sloping upwards, reflecting the growing prevalence of immigrants in the STEM workforce. While the trends by field flow in a similar direction, the spatial picture is much different. Immigrants to the US have always concentrated in ‘gateway’ cities like San Francisco, New York, and Miami. These places offer greater opportunity to new arrivals and the comforts of being around other members of their ethnic communities. The networks between earlier and later cohorts of immigrants from a country also shape the decisions of new arrivals as to schools to attend or places to work. Yet, the growing concentration of innovation is wild. Innovation has always been more spatially concentrated than the general population. But during the decades leading into the 1980s, innovation in the US was becoming more evenly distributed over cities. Labs were frequently located in ‘company towns’ or suburban office parks, and businesses rarely felt a race to locate in a particular downtown innovation district. This process reversed in the 1990s, however, and one single data point illustrates it best. Around 1975, about one in every 220 patents in the US was invented or co-invented by a Chinese or Indian ethnic inventor working in the San Francisco Bay Area. This share would have gotten a local news article, but not much more. Today, Chinese or Indian ethnic inventors in the San Francisco Bay Area contribute one in every twelve patents. To get a sense of this magnitude, it is larger than the total output of any other US state, including big ones like New York or Massachusetts. If you combine the patents of the 28 states in the country that produce the least patents, that represents about the same share. Beyond this outlier, the ten largest patenting cities account for more than half of US-based patents, while the largest urban centres are only home to about a quarter of the population. High-skilled immigration frequently acts to boost the innovation of places already blessed with it (Hunt and Gauthier-Loiselle 2010, Kerr and Lincoln 2010, Peri et al. 2015). Not surprisingly, these changes have had enormous economic impact. Many companies globally are building their strategy for understanding what goes on in places like Silicon Valley or Kendall Square. In 1995, America’s 50 largest companies by revenue as ranked by Fortune magazine conducted 42% of their innovation in the ten largest US patenting cities, which was below the 51% average for the country. In 2017, the Fortune 50 worked disproportionately in these talent clusters, conducting 68% of their innovation there compared to 58% for the country as a whole. Moreover, the relationships among the top patenting cities has changed. Due their high rates of mobility – especially when deciding where to first locate or to work after school – high-skill immigrants have increased the competition between cities for leadership in a technology space. If the next great breakthrough in a technology area emerges away from the dominate cluster, the greater role of immigrants in technology means that the new location can scale faster and perhaps gain the edge (Kerr 2010). And finally, not all is bliss inside the clusters themselves. Protests have broken out at the rising inequality within the clusters themselves, as many local residents perceive a ‘two-tiered’ system. Escalating rents and home prices can drive long-time residents out of a city, and many question whether the gains from global talent are well shared. This simmering tension is far from resolved. Bernstein, S, R Diamond, T McQuade and B Pousada (2018), “The Contribution of High-Skilled Immigrants to Innovation in the United States”, working paper. Docquier, F, R Turati, J Valette and C Vasilakis (2018), “Birthplace Diversity and Economic Growth: Evidence from the US States in the Post-World War II Period”, IZA DP No. 11802. Hanson, G, and C Liu (2018), “High-Skilled Immigration and the Comparative Advantage of Foreign Born Workers across US Occupations,” in G Hanson, W Kerr, and S Turner (eds), High-Skilled Immigration to the United States and Its Economic Consequences, Chicago: University of Chicago Press. 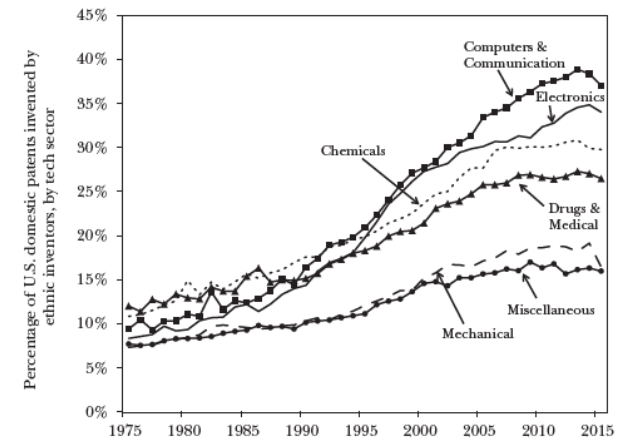 Kerr, W (2010), “Breakthrough Inventions and Migrating Clusters of Innovation,” Journal of Urban Economics67(1): 46-60. Kerr, W (2018), The Gift of Global Talent: How Migration Shapes Business, Economy & Society, Stanford University Press. Kerr, S, W Kerr, C Özden, and C Parsons (2016), “Global Talent Flows,” Journal of Economic Perspectives 30(4): 83-106. Kerr, S, W Kerr, C Özden, and C Parsons (2017), “High-Skilled Migration and Agglomeration,” Annual Review of Economics 9: 201–34. Miguelez, E, and C Fink (2013), “Measuring the International Mobility of Inventors: A New Database,” WIPO Economic Research Working Paper No. 8.